A butterfly enjoys the artwork which captures the spirit of a being who travels between the worlds and brings magic and love into our lives. When I finished writing my Faery Heart book I had a dream for the artwork on the cover – a gateway between two trees through which the magic of Faery would shine. I took up my brush and painted the first of my Faery Gates series, pouring magic into each brush-stroke as a prayer in pigment to bridge the worlds and allow enchantment to pour through for each person that gazed upon it. My flat is now full of these gates, they flow from my brush and feel like coming home. But the second that I began… it remained formless for two years. 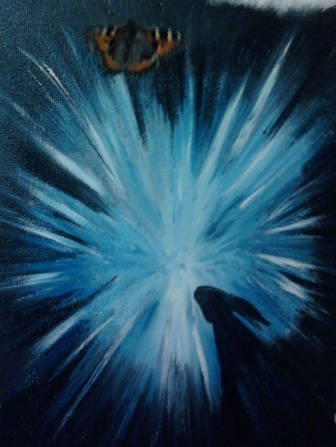 I painted the faery-light but there was something missing. So I painted others and waited. And then my bunny died. She reappeared in the painting. Finally, it was complete. Domino was a rabbit, but in the picture she also becomes a moongazing hare, carrying the magic of the ability to burrow into the dark places for healing and the sacred swiftness and stillness which is twinned in each of the long-eared Goddess-beasts across the neo-pagan world. I am producing a limited run of 50 canvas prints, hand-made, mounted, numbered and signed by me. When they’re gone I won’t be printing any more like this! To own a beautiful, limited edition print of a sacred piece of art, follow this link to my Etsy listing!